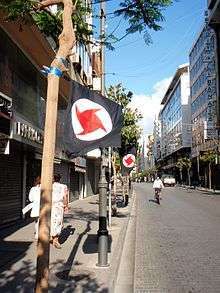 After attacking Beiruti streets, Flags of the Syrian Social Nationalist Party were raised as a victory during the unrest on May 9th, 2008. On May 9, heavy fighting broke out in Mount Lebanon between pro-government Progressive Socialist Party members and Hezbollah. The clashes started in Aytat, near Kayfoun and soon expanded to cover many spots in Mount Lebanon including Baysur, Shuweifat and Aley. Most of the fighting was concentrated on Hill 888. 1 2 3 "Death toll in Lebanon rises to 18 as clashes intensify across country". Daily Star (Lebanon). Retrieved 2008-05-11. 1 2 3 "Lebanon army gives gunmen deadline to disarm". Al Arabiya. Archived from the original on 2008-05-17. Retrieved 2008-05-13. 1 2 "Australian killed in Lebanon: DFAT". The Hawkesbury Gazette. Archived from the original on 2008-08-02. Retrieved 2008-05-12. 1 2 "Hezbollah withdrawing gunmen from Beirut". Al Arabiya. Archived from the original on 2008-05-11. Retrieved 2008-05-12. ↑ "The psychological fallout of Lebanon's 'mini civil war'". Reuters. Retrieved 2008-06-22. ↑ "Hezbollah takes over west Beirut". BBC news. 2008-05-09. Archived from the original on 11 May 2008. Retrieved 2008-05-10. ↑ "Lebanon tensions rise in clash with Hezbollah". Haaretz. Archived from the original on 12 May 2008. Retrieved 2008-05-10. 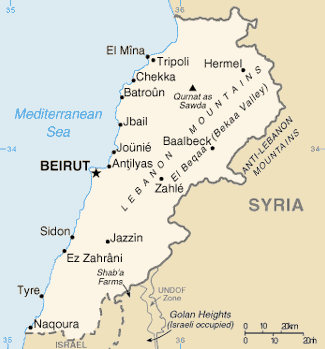 ↑ "Lebanese army moves into W. Beirut after Hezbollah takeover". Haaretz. Archived from the original on 9 May 2008. Retrieved 2008-05-10. ↑ "Hezbollah Pledges Pullout From Beirut as Army Makes Concession". Bloomberg L.P. 2008-05-10. Retrieved 2008-10-05. ↑ Worth, Robert F.; Bakri, Nada (2008-05-11). "Hezbollah to Withdraw Gunmen in Lebanon". New York Times. Retrieved 2008-10-05. ↑ "Lebanese leaders 'expect to elect a president' in 24 hours". France 24. Archived from the original on 2011-05-20. Retrieved 2008-05-31. ↑ Cecil, Bill. "Half of Lebanon rallies to demand sweeping changes". 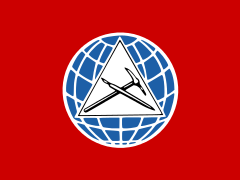 workers.org. Archived from the original on 17 May 2008. Retrieved 2008-05-09. ↑ "Hezbollah in control of west Beirut". Al Jazeera. Archived from the original on 11 May 2008. Retrieved 2008-05-09. ↑ Chassay, Clancy (2006-12-13). "Christian leader says Lebanese opposition ready for power". London: The Guardian. Archived from the original on 11 April 2008. Retrieved 2008-05-13. ↑ Patience, Martin (2007-01-26). "Lebanese Christians split over protests". BBC. Retrieved 2008-05-10. ↑ Ladki, Nadim (2007-08-06). "Lebanon by-election highlights Christian disunity". Reuters. Archived from the original on 14 May 2008. Retrieved 2008-05-10. ↑ "Aoun's hour". Al Ahram. Archived from the original on 14 May 2008. Retrieved 2008-05-13. ↑ "Hersh: Bush administration arranged support for militants attacking Lebanon". The Raw Story. Archived from the original on 2008-04-27. Retrieved 2008-05-12. ↑ Seymour M. Hersh. "The Redirection". The New Yorker. Archived from the original on 12 May 2008. Retrieved 2008-05-14. ↑ "LEBANON: Saudis disown Sunni militia". Los Angeles Times. 2008-05-19. Archived from the original on 7 July 2008. Retrieved 2008-07-15. ↑ "81 Dead in Lebanon as Hezbollah Clashes with US-Backed Pro-Government Forces". Democracy Now!. Archived from the original on 9 July 2008. Retrieved 2008-07-15. ↑ "Hezbollah's big challenge". Asia Times. Archived from the original on 13 May 2008. Retrieved 2008-05-14. 1 2 "Beirut to axe Hezbollah telecoms". BBC news. 2008-05-06. Archived from the original on 10 May 2008. Retrieved 2008-05-10. 1 2 Jim Muir (2008-05-03). "Hezbollah in airport spying row". BBC news. Archived from the original on 6 May 2008. Retrieved 2008-05-10. ↑ Nada Bakri (2008-05-09). "Shiite-Sunni Clashes Intensify in Beirut". New York Times. Retrieved 2008-05-09. ↑ "LEBANON: High prices, low wages feed violent political stand-off". IRIN. Archived from the original on 5 June 2008. Retrieved 2008-05-17. 1 2 "Gunbattles break out in Beirut". CNN. 2008-05-09. Archived from the original on 9 May 2008. Retrieved 2008-05-08. 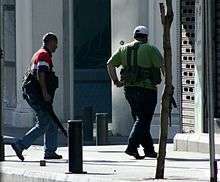 ↑ "Hezbollah gunmen seize control of Beirut neighborhoods". Forbes. Retrieved 2008-05-09. ↑ "Hezbollah militants take over West Beirut". CNN. Archived from the original on 2008-05-10. Retrieved 2008-05-09. ↑ "Beirut streets 'calm' after clashes". Al Jazeera. Archived from the original on 10 May 2008. Retrieved 2008-05-10. ↑ "Lebanon death toll up following northern clash". Ynet. Archived from the original on 15 May 2008. Retrieved 2008-05-16. ↑ "Six killed during Beirut funeral: medics". France 24. Archived from the original on May 10, 2008. Retrieved 2008-05-10. ↑ "Aussie's death sparks Lebanon alert". The Sydney Morning Herald. 2008-05-12. Retrieved 30 July 2011. ↑ Jackson, Andra (2008-05-12). "Melbourne man killed in Lebanon 'was on holiday'". The Age. Melbourne. Retrieved 30 July 2011. ↑ "Day 5: Lebanese dare to hope worst is over". Daily Star (Lebanon). Archived from the original on 17 May 2008. Retrieved 2008-05-16. ↑ "12 killed in pro and anti-government gun battle in northern Lebanon". Ynet. Retrieved 2008-05-16. ↑ Robert F. Worth (2008-05-11). "Hezbollah to Withdraw Gunmen in Lebanon". The New York Times. Archived from the original on October 26, 2010. Retrieved 2008-05-11. 1 2 Yoav Stern. "Hezbollah fighters retreat from Beirut after 37 die in clashes". Haaretz. Archived from the original on 12 May 2008. Retrieved 2008-05-11. ↑ "Lebanese army revokes government decisions against Hezbollah". France 24. Archived from the original on 14 May 2008. Retrieved 2008-05-11. 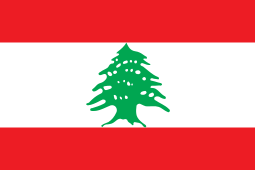 ↑ "Lebanese army sends troops north". BBC. 2008-05-11. Archived from the original on 14 May 2008. Retrieved 2008-05-16. 1 2 3 "Day 5: Lebanese dare to hope worst is over". The Daily Star (Lebanon). Retrieved 2008-05-12. ↑ Kandy Ringer. "Lebanon's Fighting Spreads to Druze Heartland". BBC News. Archived from the original on May 14, 2008. Retrieved 2008-12-24. ↑ "Saturday's live coverage of the war in Lebanon". Ya Libnan. Retrieved 2008-12-24. ↑ "Fighting spreads in Lebanon". Al Jazeera. Archived from the original on 14 May 2008. Retrieved 2008-05-16. ↑ Nicholas Blanford/Qmatiyeh (2008-05-13). "Hizballah's Toughest Foe in Lebanon". Time (magazine). Retrieved 2008-12-24. ↑ "Hezbollah-led forces take revolt to mountains above Beirut". CNN. Archived from the original on 2008-05-14. Retrieved 2008-05-15. ↑ "Hizballah's Toughest Foe in Lebanon". Time (magazine). Archived from the original on November 4, 2012. Retrieved 2008-05-14. ↑ "Monday's live coverage of the war in Lebanon". Ya Libnan. Retrieved 2008-12-24. 1 2 "Fresh clashes in north Lebanon". Al Jazeera. Archived from the original on 12 May 2008. Retrieved 2008-05-12. ↑ "Lebanese army deploys troops around the country to impose law and order by force". The Conservative Voice. Retrieved 2008-05-19. 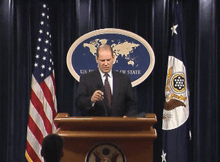 ↑ "Tuesday's live coverage of the war in Lebanon". Ya Libnan. Archived from the original on 17 May 2008. Retrieved 2008-05-19. ↑ "'Deal reached' on Lebanon impasse". Al Jazeera. Archived from the original on 16 May 2008. Retrieved 2008-05-15. ↑ "Breaking News: Live coverage of the war in Lebanon". Ya Libnan. Archived from the original on 15 May 2008. Retrieved 2008-05-15. ↑ "Several injured in northern Lebanon clashes". France 24. Retrieved 2008-06-22. ↑ Bassem Mroue. "Fighting breaks out in northern Lebanon; 4 dead". Associated Press. Retrieved 2008-09-10. ↑ "Three dead, 30 wounded in north Lebanon clashes". Reuters. 2008-06-22. Retrieved 2008-09-10. ↑ "Heavy fighting rocks north Lebanon". Al Jazeera. Archived from the original on 9 September 2008. Retrieved 2008-09-10. ↑ "Lebanon opposition member Saleh Aridi killed in car bomb blast". The Australian. 2008-09-11. Retrieved 2008-09-30. ↑ Chulov, Martin (2008-09-12). "Violence returns to Beirut as car bomb kills sheik". The Australian. Retrieved 2008-09-30. 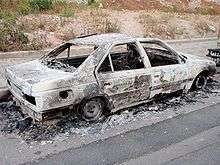 ↑ "Nine killed in sectarian fighting in Lebanon". France 24. Retrieved 2008-09-10. ↑ Suzan Haidamous. "North Lebanon reconciliation struck through joint efforts". Xinhua News Agency. Retrieved 2008-12-24. ↑ "Hariri tells Alawites in north Lebanon: We are all Lebanese". Ya Libnan. Retrieved 2008-12-24. ↑ "Lebanon bomb hits bus carrying soldiers". London: Reuters. 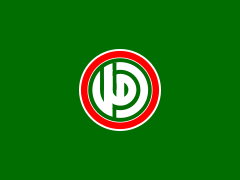 2008-09-29. Archived from the original on 5 December 2008. Retrieved 2008-12-24. ↑ Andrew Wander (2008-09-29). "Lebanon: Bus bomb kills soldiers in Tripoli". London: The Daily Telegraph. Retrieved 2008-12-24. ↑ "Iran highlights need for Lebanese unity". Press TV. Retrieved 2008-05-12. ↑ Shihri, Abdullah (2008-05-13). "Saudi Arabia criticizes Iran's Hezbollah support". Boston Globe. Retrieved 2008-05-30. ↑ "Lebanon army moves to end crisis". BBC News. 2008-05-10. Archived from the original on 11 May 2008. Retrieved 2008-05-10. ↑ Karam, Zeina (2008-05-10). "Hezbollah fighters in Beirut melt away". Boston Globe. Archived from the original on June 13, 2008. Retrieved 2008-05-11. ↑ "At least two dead in shooting at funeral in Lebanon". Reuters. 2008-05-10. Retrieved 2008-05-14. ↑ "Hezbollah to withdraw gunmen in Lebanon". International Herald Tribune. Retrieved 2008-05-15.